This month for SRC, I was assigned Emily's blog, Nomnivorous. If you're wondering what SRC is, its a fun club called the Secret Recipe Club, started by Amanda of Amanda's Cooking. Each month we are assigned a blog that we need to pick a recipe from and recreate it, but here's the catch, its a secret, you cannot let out which blog you've been assigned till the reveal day, sorta like Secret Santa, but with great food. If you'd like to join in or see some of the previous reveals, check out Secret Recipe Club. 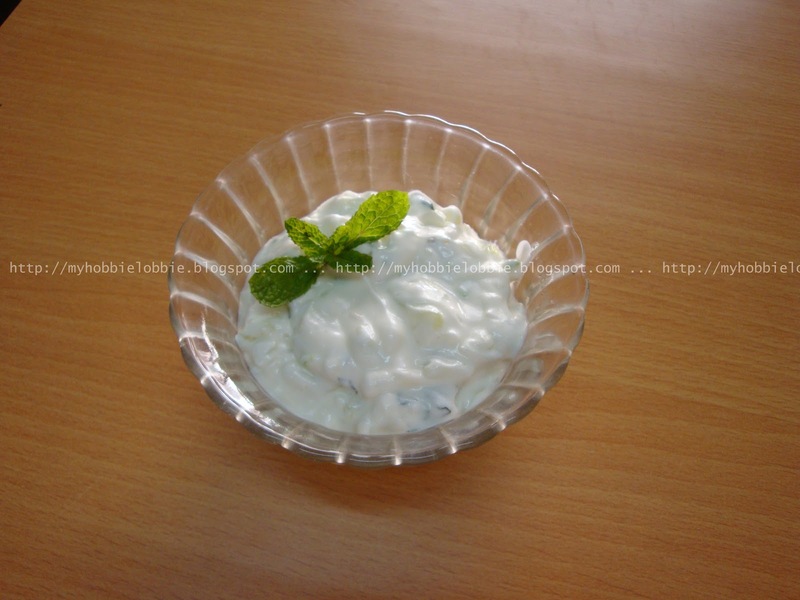 When I was going through Emily's blog, I came across a recipe for Tzatziki - a Greek meze or appetizer and it reminded me of our very own Indian Raita. I was amazed at the differences in the recipes despite the similarity in the look of both. I knew I had to try it to see the impact on flavors. I had previously seen an episode of Masterchef Australia - Season 2, where George Calombaris made a traditional Greek version and I've wanted to try it out since then. This was the perfect opportunity. I whipped up a version using a combination of both recipes and I really loved how it turned out. It had a creamy texture and at the same time tasted so fresh. I could finish a bowlful of this by itself. This would also be a wonderful accompaniment to grilled meats or some spicy tandoori chicken. It will be lovely as a dip to serve with a platter of chips and crudités as well. I know I'll be making this often. Combine all the ingredients together, making sure everything is well mixed. Mmm, this looks so good and so easy too. I love a good tzatziki. Tzatziki is one of my favorite condiments. It adds such a fresh taste! Great job!! This looks great as well! My oldest son would happily devour this entire bowl. He loves tzatziki. Thanks Sanjeeta, Kristen, Emily and Mary! I love tzatziki - I could put it on anything. I love tzatziki. I've never made it with honey, though. I'll have to try that. Yum. I'm pretty sure that I could live on Tzatziki Sauce. This recipe looks awesome! Good to know about the secret recipe club. Thanks for sharing this recipe. It will make a delicious raita for sure. Look Delicious!!! Great SCR Choice! This is my all time favorite dip! I put it on everything! LOVE it!!! you. Great Post! The tzatziki sound delish! I like your idea of serving it with spicy meats like tandoori chicken...sounds like a good match. I've never had tzaziki with mint or chili - I must try it! Love tzaziki and yours sounds delicious. I love tzatziki - this looks so good, wish I had some now! Great choice for SRC. I must confess, I've never tried tzatziki.... I have no excuse now that you've posted a recipe! Thanks everyone for stopping by and for taking the time to leave a comment. A little update - this tastes even better the next day - of course you need to keep it refrigerated. A nice riff on tzaziki with mint and chili. Thanks for sharing and being an SRCer! Simple & delicious. This looks like a must try. Thannks Rituparna, I hope you love it as much as I do! Love the flavors in this recipe! Stopping by from SRC. mmm, would love this on a gyro! Thanks for checking out my SRC post :) So fun to be in it with you! Oh no way. I love tzatziki and then to put it on almost anything. Gyro's of course are my favorite, so I am going to have to whip up a batch of this. Yum!! I love tzatziki. I go to a Greek restaurant often to order a gyro and waffle fries and dip my fries into the sauce. Yummy! Thanks Desi, Nicole, Amy, Rochelle and Gloria! What a great recipe. I've never heard of it before. Thanks for participating in the SRC with me (Group B). Here is my post from this month: Pioneer Woman's Chicken Pot Pie.